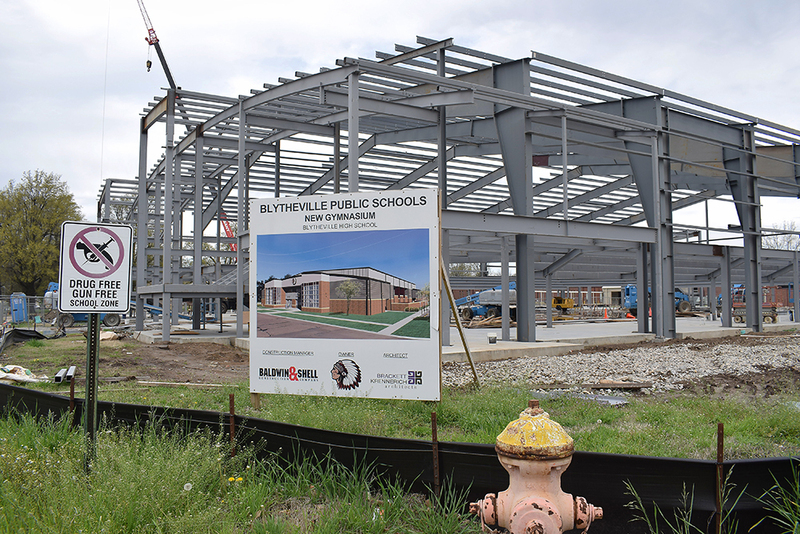 The “big frame” of steel beams on the site of the brand-new Blytheville High School multi-purpose arena has been erected, says district director of Operations Randy Jumper. The next item to be completed will be the roof, and Jumper added that 2019-20 basketball games could begin at the arena by November, and certainly by January. Randy Jumper would be the first to say that Baldwin & Shell Construction of Little Rock personnel still have quite a long way to go before the Blytheville School District’s multi-purpose arena is ready for basketball games, but he did point out that before the 2019-20 basketball season ends the Chickasaws and Lady Chickasaws would be on the court. The “truss” (roof) is incomplete, said Jumper, who went on to say that if weather cooperates it could be completed by the end of the week. The roof, which he said would have taken six weeks to complete, will be the next item to be finished, and once done the construction workers will focus on the concrete work, or block work. That will include masonry, work on the locker rooms and other items that can only be done once the roof is up and provides a shelter for the workers. The basketball teams’ schedules will commence in November but Jumper added that AAAA/3 Conference games won’t begin until December, and league games won’t start in earnest until January.